Hello everyone! Yay! The weekend is finally here! 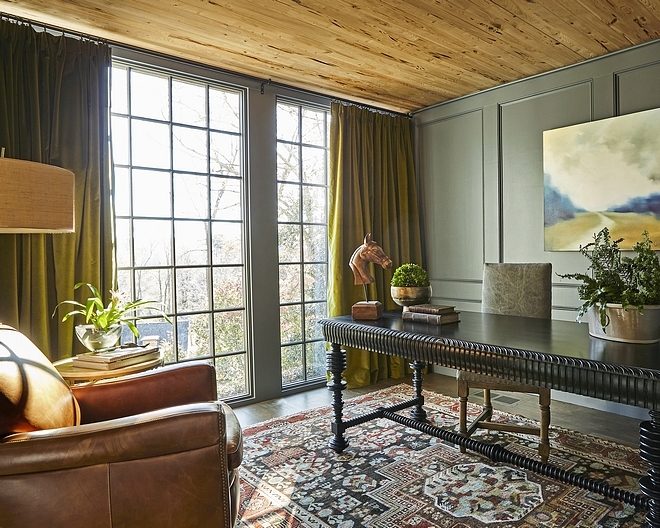 I want to wish you all a wonderful Father’s Day and I hope you have a great and relaxing time seeing this beautiful transitional home by Christopher Architecture & Interiors on our Interior Design Ideas series. 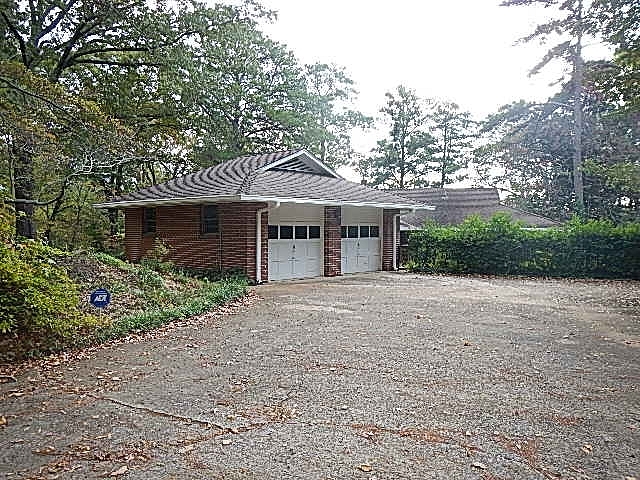 “A dated 1950’s ranch, sitting on a non-conforming lot, precipitated all design initiatives. “Keep the footprint” was a must. 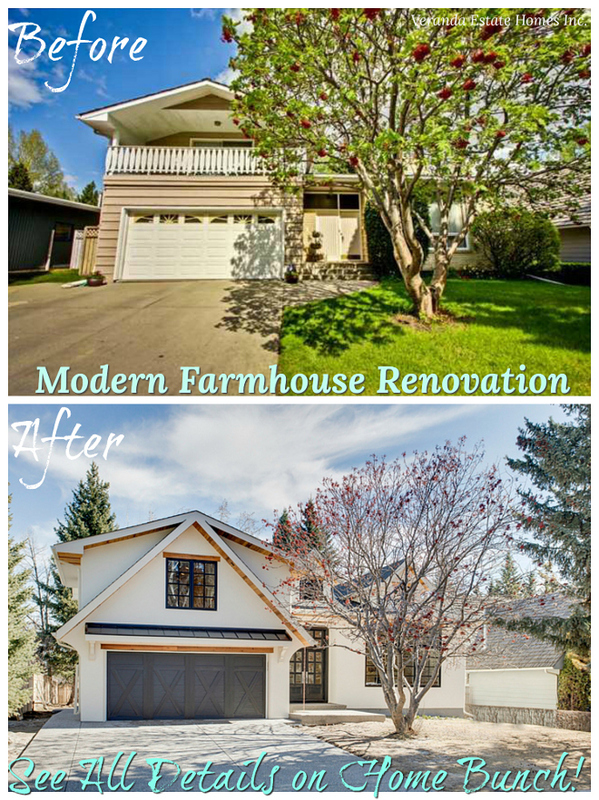 Our design team was able to save all existing foundation elements, basement and first level walls. We added a second level and the rest is almost unrecognizable from its previous form. 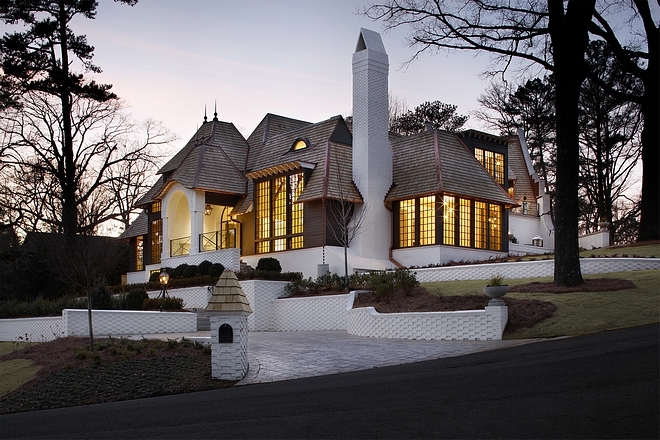 This eclectic design is dominated by massive windows, providing spectacular natural light and wonderful views. 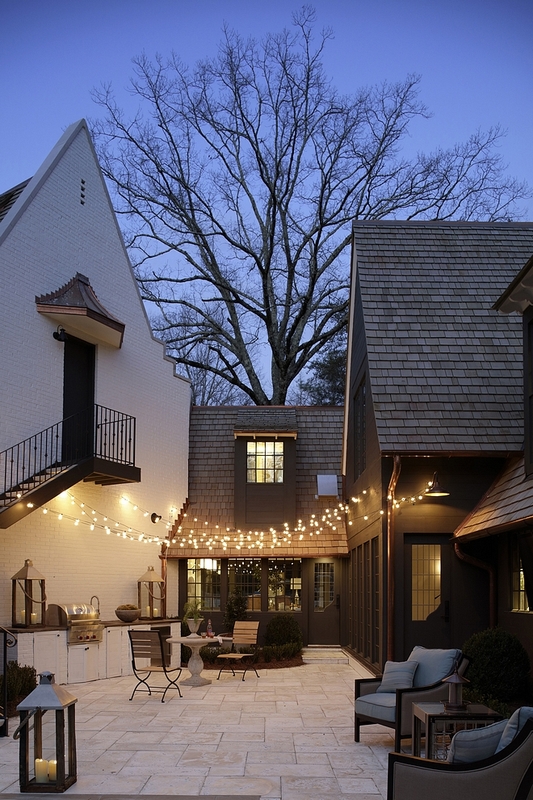 We utilized the “quirky” detached garage to frame an amazing courtyard and to create a wonderful guest suite. Texture in the brick, steel and glass handrails, and many other details provide the participant hours of search and study. Christopher Ai opened this home for tours, raising over $250,000 for a pediatric cancer research charity Open Hands Overflowing Hearts. In 1950, when the original home was built, the sprawling farmhouse, green wallcovering, and pink ceramics were novel. While some (pink ceramics) may have come back in-style, the general look and feel of the existing structure was beyond “dated”. 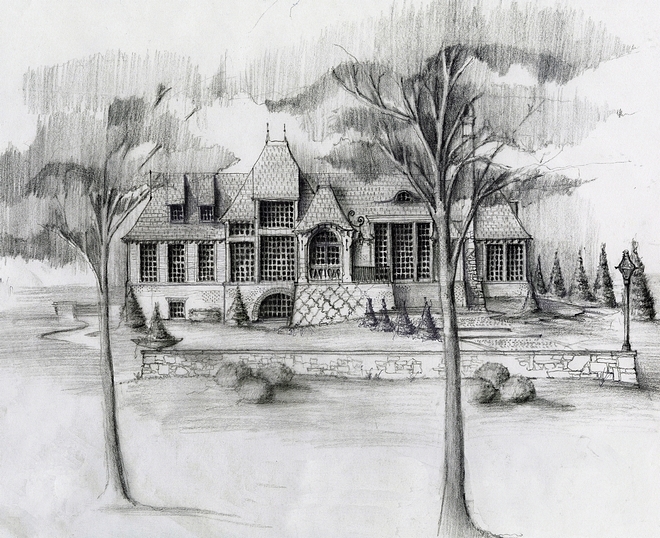 The design team, made up of interior design and architecture, pushed aside cobwebs and stepped over rotten floors but left the home with a vision for something special. “We knew the house could be amazing, given the dramatic site and the quirky nature of the ‘sprawl’” (the house and garage meander). The renovation was nothing short of transformational. While the designers kept the existing footprint and main level framing intact, the updates leave the old structure unrecognizable. 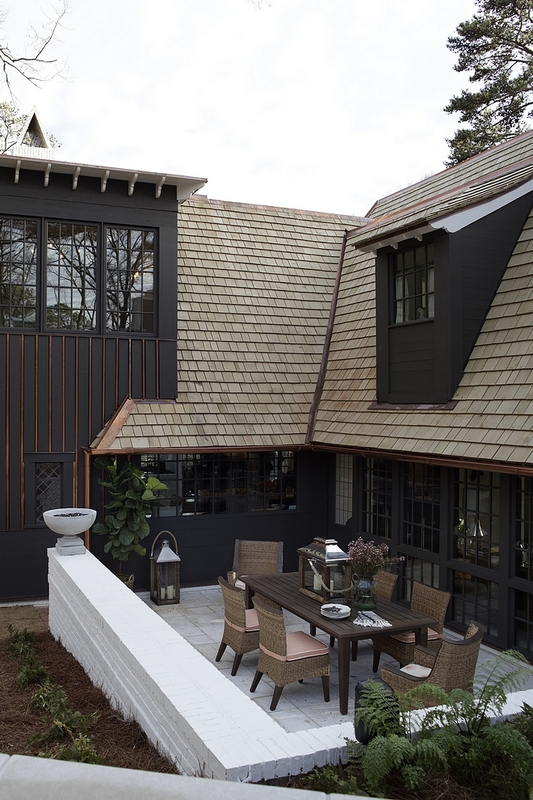 The design team added a second level, windows, roof, created a spectacular rear courtyard, and transformed the detached garage into a carriage house with conditioned access to the main residence. “We wanted to use as much of the existing material as possible”, said the architect as he described the way they brought life to the existing brick by introducing a custom brick pattern and painting it with a Benjamin Moore’s Oxford White. 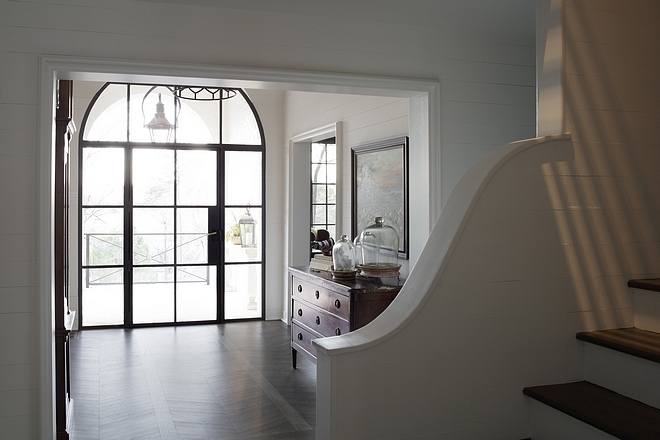 Or the way they salvaged the existing 2 ¼ white oak hardwoods and reintroduced them as a chevron pattern in the foyer. 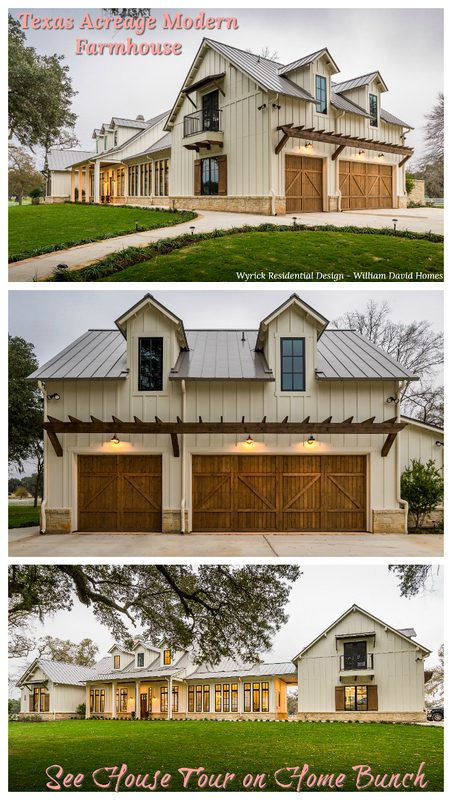 New custom designed garage doors and 2x shiplap cypress siding complement the Alaskan cypress roof. Large direct-set windows cover over seventy percent of the façade, providing both an amazing view from the site’s crest but also warm natural light throughout the home. Perched on a hill, the drive leads you around the house allowing small glimpses to the beauty of the interiors. The expansive windows were an opportunity to specify spectacular light fixtures that could be viewed as you approach the house. Chimney Pots- Clay chimney pots, Southern Clay. 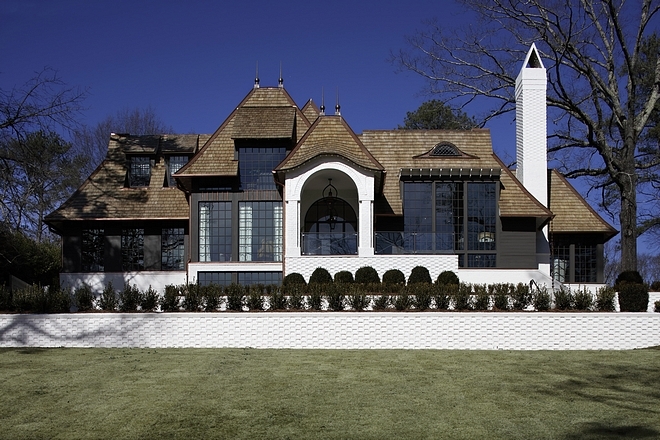 Creating a Showhouse is always a designer’s dream. Working with a blank slate, boundaries could be tested and a truly unique product that takes current trends to the next level could be developed. With no limitations, bold statement pieces that expand the imagination and encourage people to think outside the box were selected. Exterior Gas Lamps- Bevolo – similar here (pendant), here & here (electric). 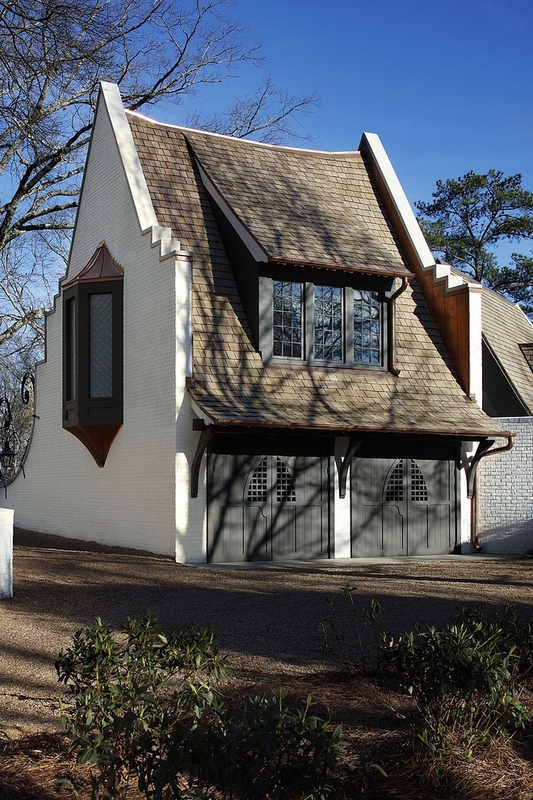 Exterior Trim Paint Color: Benjamin Moore Dragon’s Breath. 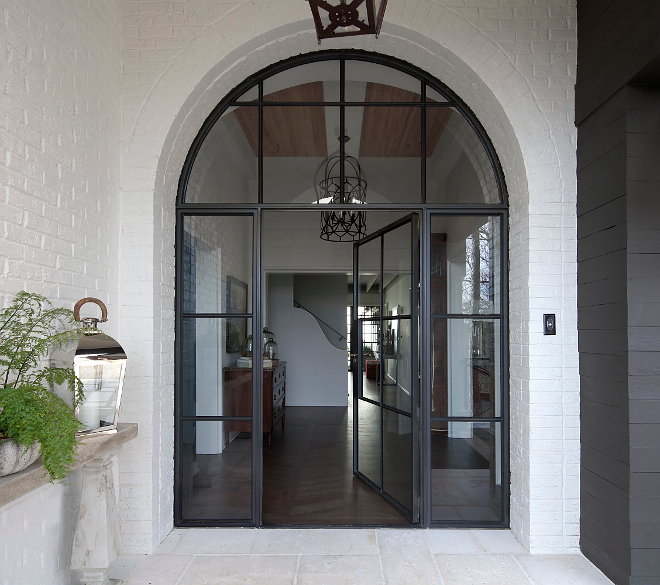 The black metal and glass arched front door is custom. Front Door: Red Mountain Iron Rails, Weldon Weldong. Beautiful Outdoor Console Tables: Here, Here & Here. Lanterns: Here, Here & Here. 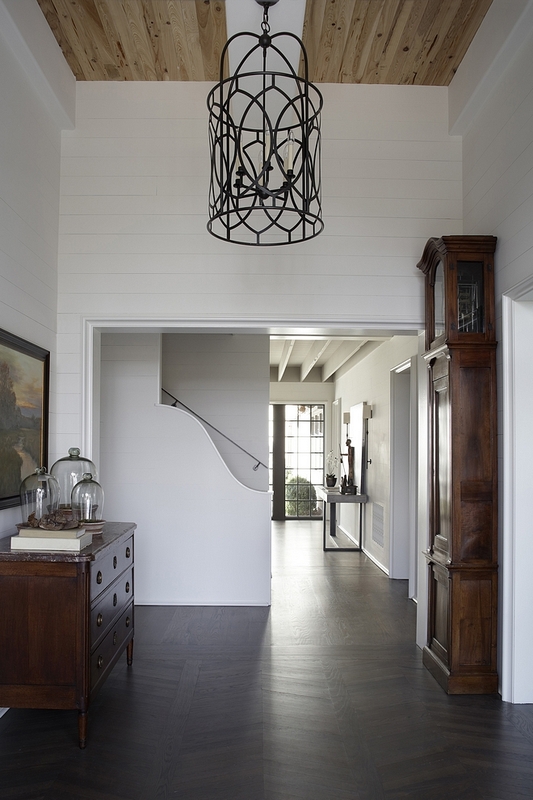 The foyer features Pecky Cypress Ceilings and Pine wall paneling painted in Benjamin Moore White Dove OC-17. Staircase Lighting: Visual Comfort Gustavian Lantern/Aged Iron & 2 light Cross Bouillote Sconce. 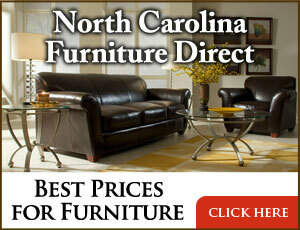 Furnishings: Lolo French Antiques – Others: here (antique), here (ditressed white) & here. The oversized dining room light centered among three walls of glass is a favorite. Ceiling is Pecky Cypress with greywash and trim paint color is Benjamin Moore Chelsea Gray. Wallcovering: Schumacher Feather Bloom/Dove – Find beautiful wallpapers here. Chandelier: Currey & Company – similar here. Beautiful Dining Tables: here, here, here, here & here. Once inside the home, you are immediately drawn to the great room with 12-foot ceilings and custom limestone fireplace. Wall paint color is Benjamin Moore Northern Cliffs and windows are Benjamin Moore Chelsea Grey. Fireplace is Limestone. Chandelier: Currey & Co. Chandelier – similar here (smaller – currently on sale). 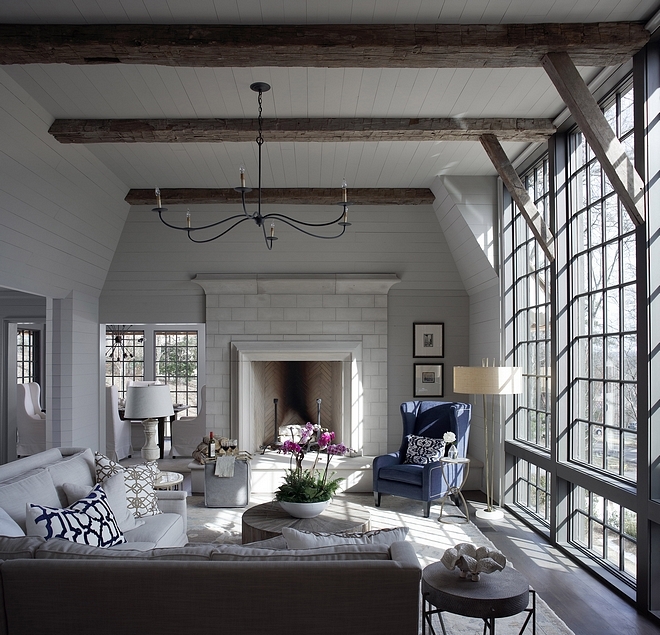 Beams are reclaimed, through Chestnut Design Studio. Sectional: Gabby Home – similar here, here, here & here. Faux Concrete Top Side Table: Gabby. Rug: Kings House Orientals – similar here &here. 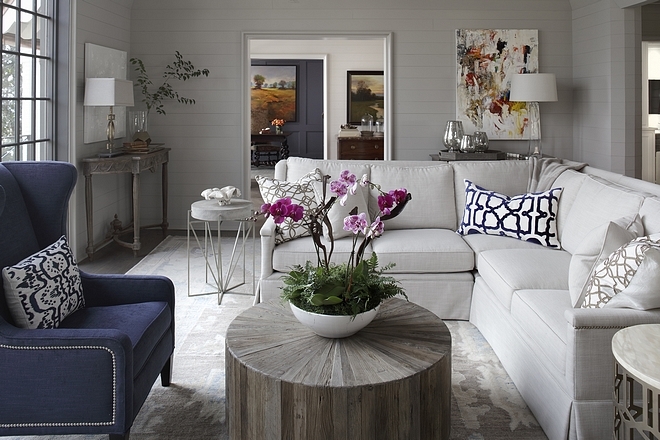 Each room in the Showhouse was designed with the anticipation of how someone will use it. Traffic flow, lighting, and views of the outdoors were all considered when arranging furniture layouts, selecting finishes/materials and specifying fabrics. 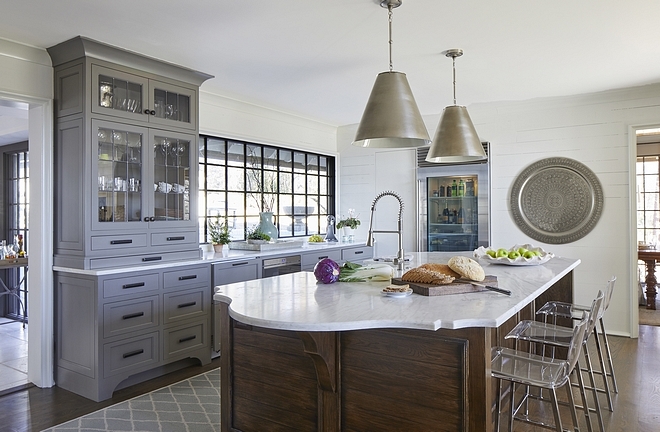 Open to the kitchen, the 10-foot long island of Alabama White marble was designed as the focal point. Walls are Pine Paneling, Benjamin Moore Northern Cliffs. Counterstools: CB2 – Backless Acrylic Counterstools: Here. 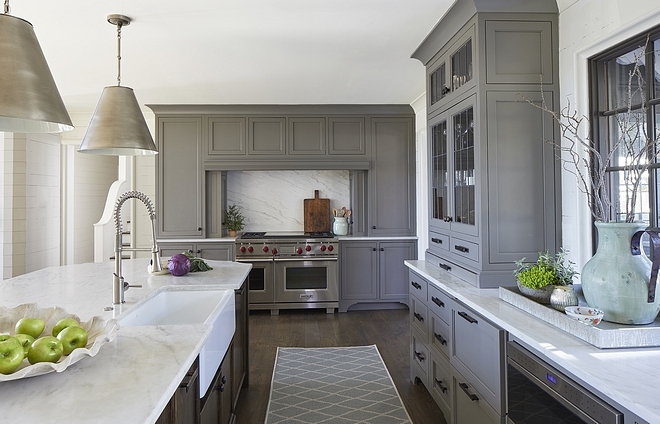 Cabinet Paint Color: Chelsea Gray HC-168 Benjamin Moore. Industrial Kitchen Faucets: here, here & here. Kitchen Farmhouse Sink: here, here, here, here & here. The Breakfast Room offers a custom banquette, custom ceiling applique and views of the courtyard nestled between the house and carriage house were provided. Dining Tables: Here, Here, Here, Here, Here & Here. Beautiful Dining Benched & Banquettes: Here. Design should have a seamless interaction with its surroundings. Thus, with this transitional home, the design team worked tirelessly to create a cohesive and symbiotic relationship between the interiors, architecture, and landscape. The participant’s experience, when indoors, is enhanced by the views of the living courtyard. 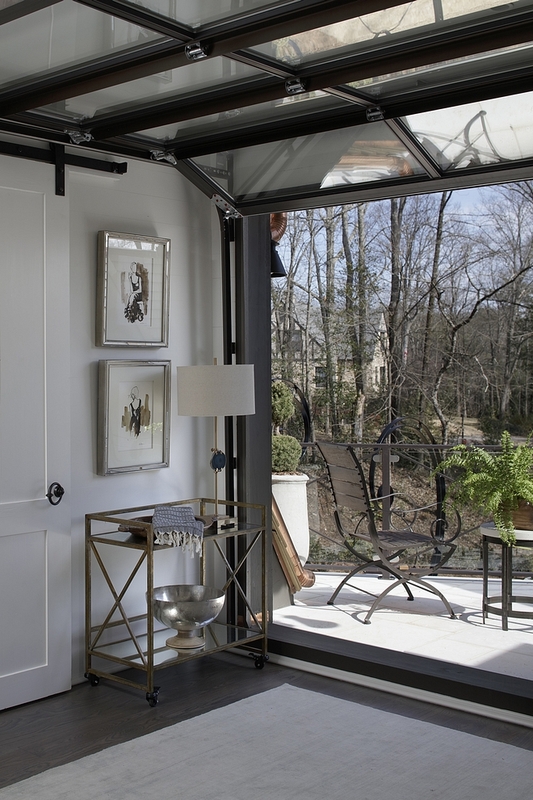 The kitchen, breakfast, living room spaces, laundry, and even the master closet all have a direct relationship to this dramatic space; not only providing a view but also drawing you outdoors. “We wanted the space to be functional, aesthetic, engaging, and fun” said the architecture and interior design team. 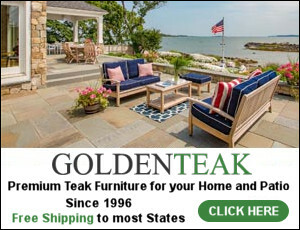 Outdoor Courtyard: Furnishings and accessories, Summer Classics & Elegant Earth. Similar Patio Set: Here. 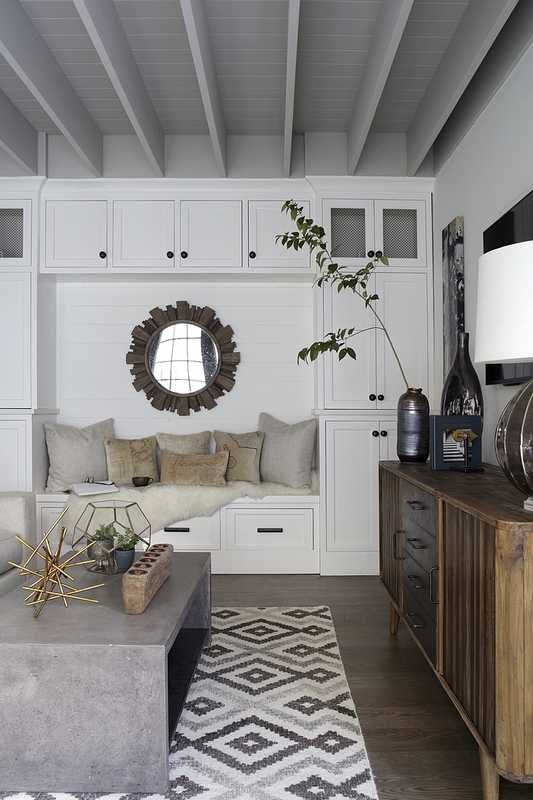 Family room features built-in lockers painted in Benjamin Moore White Dove. Grey ceiling is exposed framing painted Benjamin Moore Northern Cliffs. Sconces: Visual Comfort – Large (not shown). Beautiful Faux Concrete Coffee Tables: here, here, here, here, here, here & here. Beautiful Mirrors: here, here, here, here, here & here. 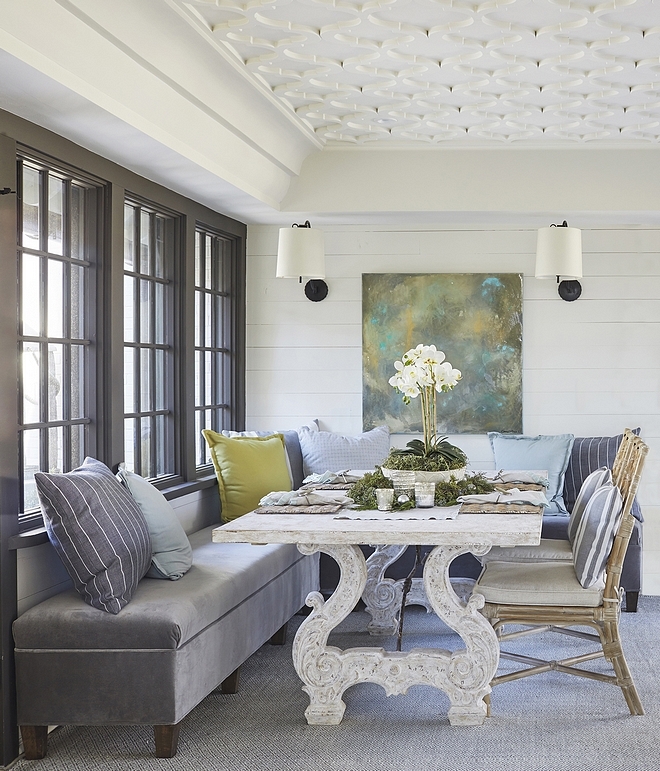 The sunroom is painted in Chelsea Gray by Benjamin Moore, reclaimed wood ceiling and features a rope swing bed. Beautiful Rope Swing Beds: here & here. How stunning is this vanity?! 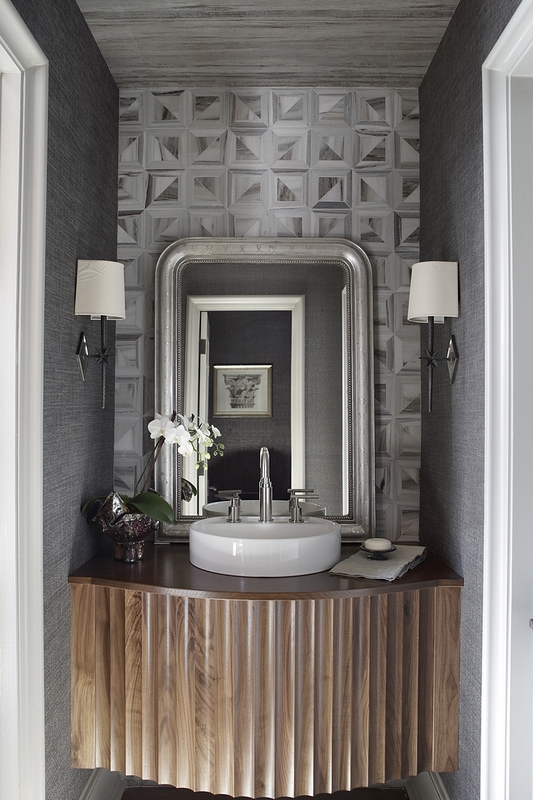 The wallcovering is Phillip Jeffries and Nobilis. Silver Beaded Mirrors: Here, Here, Here, Here & Here. This is a gorgeous study with plenty of personality! Ceiling is Pecky Cypress paneling. Paint color is Ashland Slate by Benjamin Moore. 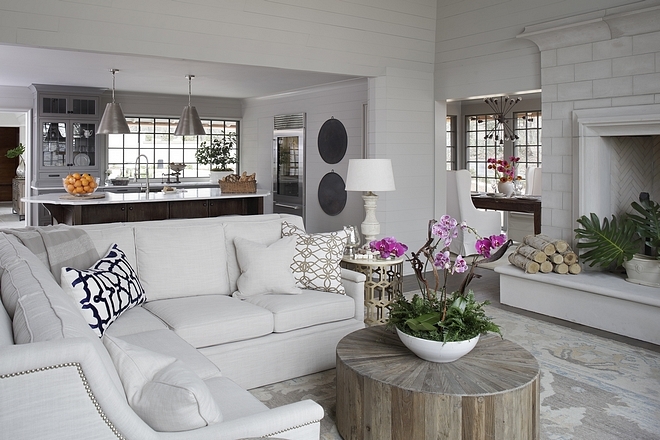 White Shiplap Paint Color: Benjamin Moore White Dove. Modern Round Coffee Tables: Here, Here, Here, Here (ombre), Here, Here & Here. Similar Wood Frame Chair (left): Here, Here, Here & Here. Lighting: Visual Comfort Broomfield Large Pendant. 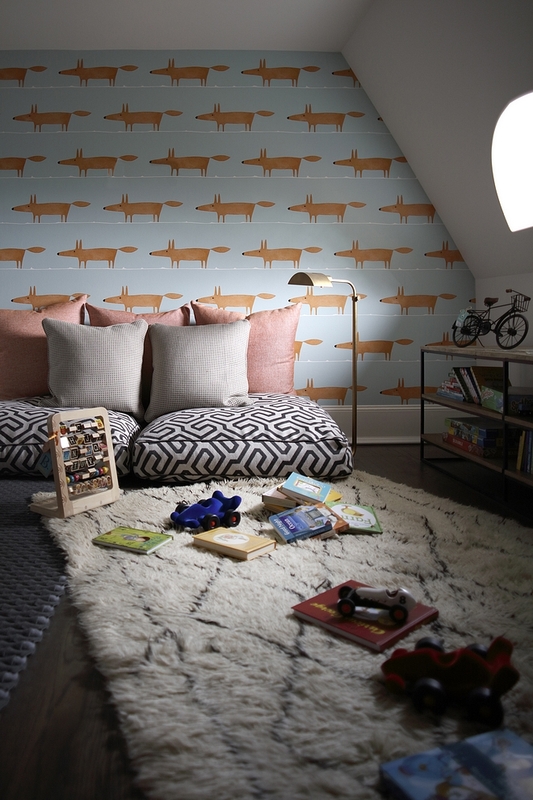 Wallpaper: Scion Mr Fox – similar here. Walls are Benjamin Moore White Dove. Rug: Land of the Nod. Walls Paint Color: Horizon by Benjamin Moore. Lighting: Visual Comfort Hampton Large Pendant in Burnished Silver Leaf. Beautiful Mongolian Stools: here, here, here, here, here, here. Acrylic Crib: Here – Similar: Here & Here. Storage Baskets: Here, Here, Here & Here. 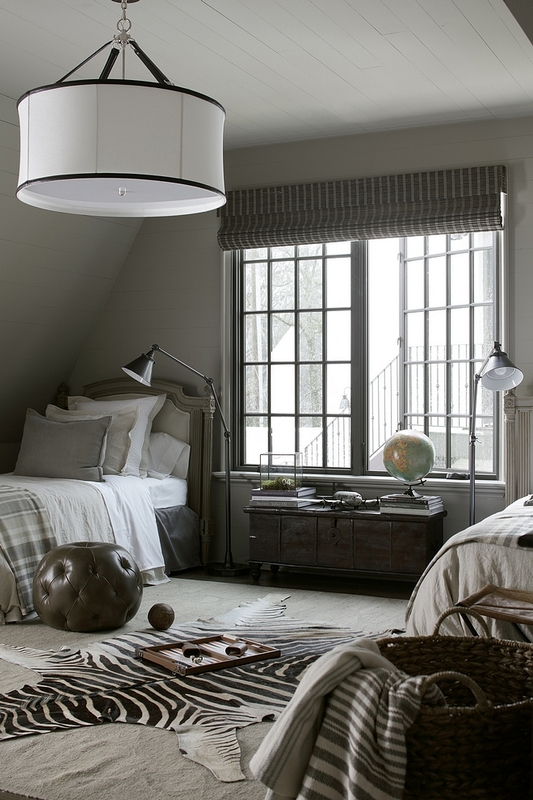 Grey Ceiling: Benjamin Moore Cobblestone. Ceiling Light: Visual Comfort – Large. The carriage house features a kitchenette and comfortable furnishings. Walls are BM White Dove. A custom garage door opens to a private balcony. 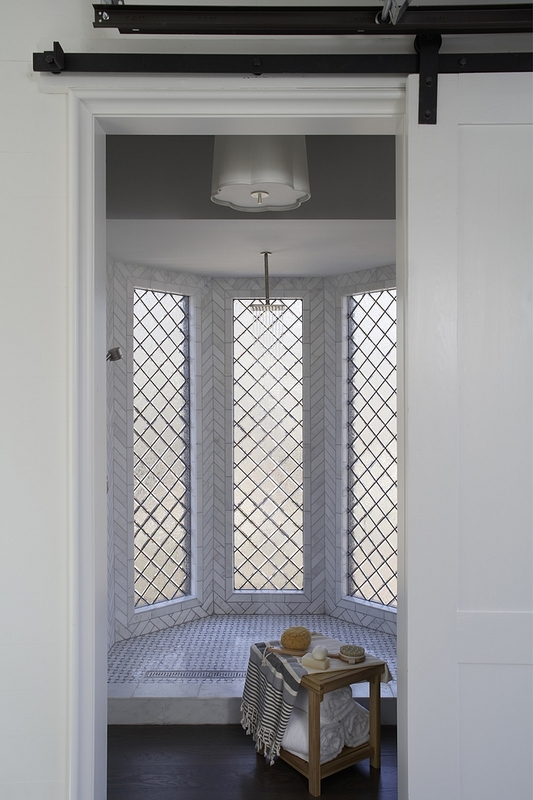 Bathroom features walk-in shower with a basketweave floor and herringbone walls. Ceiling paint color is Benjamin Moore Stonington Gray. 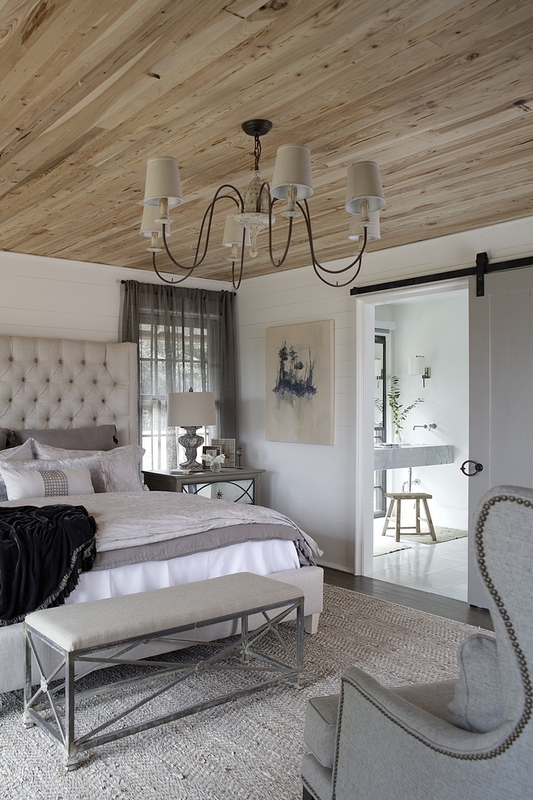 The master bedroom feels so warm with the Pecky Cypress ceilings. Walls are painted in Benjamin Moore White Dove. Similar Rug: Serena & Lily. Bathroom paint color is also BM OC-17. The bathroom designed required a tub, shower, double vanity, toilet room, and walk in closet. With only 255 square feet, this task seemed impossible. The solution was unique in its approach and delivery. “Why not recess the shower floor and let it double as a large jetted tub”. The elegant enclosure serves the daily shower need as well as the luxurious/less-frequent desire for a spa-like tub experience. 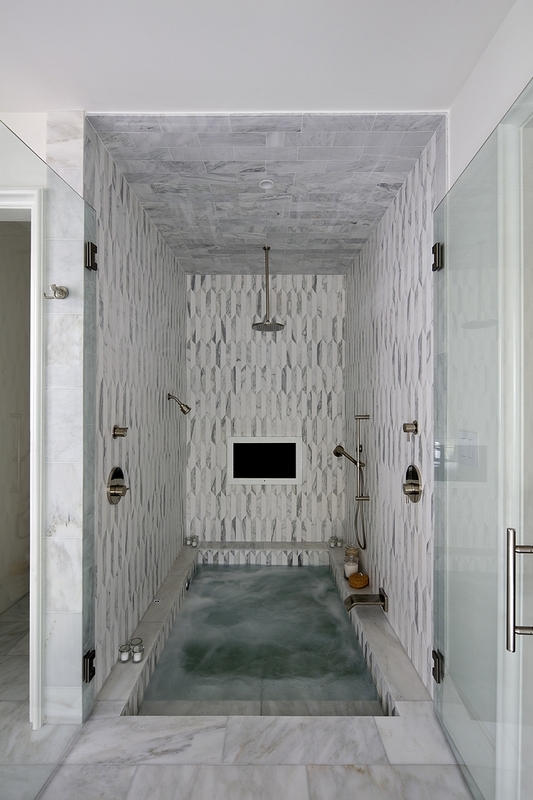 Adjacent to the dramatic tub/shower combination, Christopher AI designed a floating marble vanity in front of a full-height wall to wall window. The challenge for placement of faucets was met with side-mounted Kohler spouts that hover over the two integral sinks in the marble. Custom, ceiling-mounted iron mirrors were designed to be suspended in front of the glass. A motorized Lutron shade provides privacy at the touch of a button. 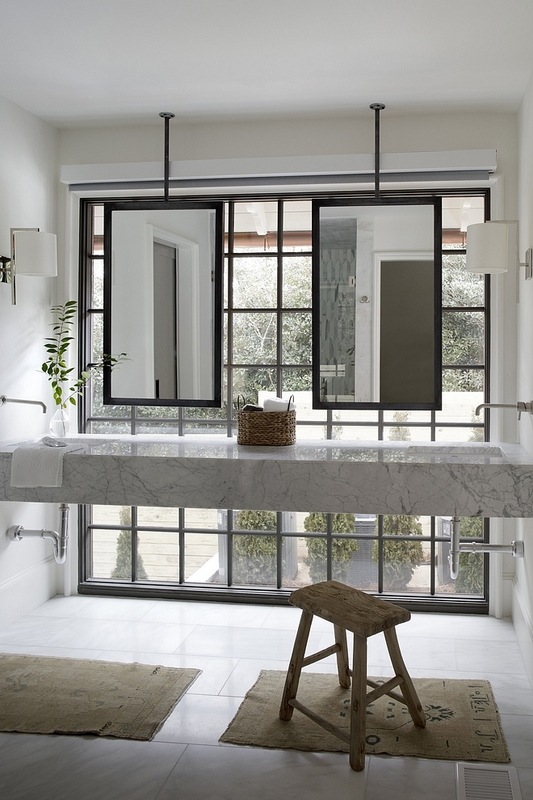 Joanna Goodman (Vice President and Director of Interiors) and Chris Reebals (President and Senior Architect) worked collaboratively to design the master bathroom; selecting locally sourced marble and accessorizing with subtle accents to soften the space. The cocktail pool is flanked by two dramatic bronze fountain scuppers and a beautifully designed limestone fireplace adorned with limestone fireballs. The custom paver surface is complimented by a full outdoor kitchen and warm landscape elements which soften the hard surfaces. 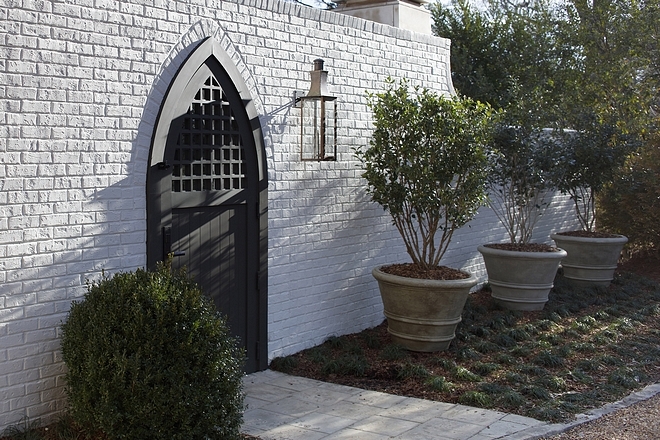 Custom iron stairs and an immaculate Gothic arched door complete the masonry courtyard wall. Landscape Architecture- Dave Eyrich, Environmental Studios. Every detail is finely crafted and proportionally scaled to welcome a robust party or intimate gathering in this private courtyard. Outdoor String Lights: Here &Here. Photography: Chris Luker Photography & @jallsopp. 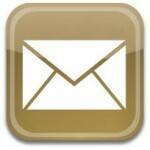 Posts of the Week: New-Construction Home for First-time Home Buyer.